A 44 percent growth in farm income between the second and third quarters of 2015 put South Dakota on top nationally for personal income growth, according to a U.S. Bureau of Economic Analysis news release. "Farm earnings grew 17.5 percent (nationwide) in the third quarter after falling 4.5 percent in the second. The increase in farm earnings exceeded 25 percent in six of the seven states in the Plains Region (Iowa, Kansas, Minnesota, Missouri, Nebraska, and South Dakota) and contributed the most to their personal income growth. Third-quarter farm earnings primarily reflected lower production expenses, including lower fuel and livestock costs." Overall, the Rushmore state's income grew 2.2 percent quarter-over-quarter, making it No.  1 for growth in that timeframe. That provides a rebound after South Dakota's personal income shrunk 2.7 percent between the fourth quarter of 2014 and the first quarter of 2015, then grew 1.4 percent into the second quarter of 2015. Now at No. 1, South Dakota was followed closely by neighbors Nebraska, at No. 2, and Iowa, at No. 3. Other neighbors ranked No. 11 - Minnesota; No. 16 -- Montana; No. 44 -- Wyoming, and No. 48 -- North Dakota. Both Wyoming and North Dakota have been hit by continued contraction in the oil industry, and income from their mining industries have shrunk. In South Dakota, mining income fell 0.6 percent between Q2 and Q3 2016. Nationally, earnings fell 1.9 percent in mining in the third quarter, after falling 5.5 percent in the second quarter and 0.6 percent in the first quarter of 2015. Despite the slow-down in the energy sector, personal income grew in every state between Q2 and Q3 2015, with an average growth of 1.3 percent among the 50 states. Alaska experienced the least amount of growth, at 0.6 percent. Nationally, nonfarm earnings grew 1.3 percent in both the second and third quarters. of 2015 The largest percentage increases in the third quarter were in Arizona and Oregon where nonfarm earnings grew 1.6 percent. A non-farm breakout for South Dakota was not provided. In 2014, South Dakotans' median income rose to its highest rate in a decade, $50,979, but that still reflects a stagnant income for South Dakotans and leaves the Rushmore State next to last among its neighbors, according to recently updated federal data. And while South Dakota's $50,979 is the state's recent high point for median income, it isn't by much. Since 2006, South Dakota's median income -- in inflation-adjusted 2014 dollars -- has stayed close to the $50,000 mark, with a low of $49,582 in 2007 and a second-highest of $50,856 in 2011. That compares to $50,128 in 1999 (in dollars adjusted for inflation). As the nationwide median income has fallen since the Great Recession in 2008-2009, South Dakotans' incomes are closer to the national median but still below the $53,657 figure from 2014. That national income figure compares to $57,936 in 2007 and to $59,664 in 1999 (inflation-adjusted to 2014 dollars). South Dakota households headed by young adults and senior citizens have consistently posted the lowest median incomes, while those ages 45-64 have posted the highest. Median incomes vary widely in South Dakota depending on household type. Married couples with children posted incomes more than three times higher than households with children headed by single women -- $81,458 versus $25,159. Married couples without children took in median incomes of $71,708 compared to households with children headed by single men, $37,047. Geography affects median incomes in South Dakota, too. The Sioux Falls metropolitan area has consistently posted higher median incomes than the Rapid City metro area and the state as a whole. And since 2012, incomes have been growing faster in the Sioux Falls metro area than elsewhere. In 2014, the Sioux Falls metro area -- Lincoln, McCook, Minnehaha and Turner counties -- had a median income of $58,849, up about $5,000 from 2012 but still below the recent high in 2008 of $62,545. That compares to $49,808 in 2014 for the Rapid City metro area -- Custer, Meade and Pennington counties -- where incomes have been sliding since 2011 from $53,007. Median incomes in households headed by single mothers were just above the poverty rate at $25,159, while median income in households with a married couple and children topped $80,000. The poverty rate for a family of four was $23,834 in 2014. See the median income for various types of households for the past several years here. South Dakotans living in the Rapid City metro area (Pennington, Meade and Custer counties) had household median incomes lower than those of residents of the Sioux Falls metro area (Lincoln, McCook, Minnehaha, and Turner counties) -- $49,808 vs. $58,849. 2014 marked the year South Dakota has come closest to the national average for household median income. In 2014, South Dakota's median income of $50,949 was $2,678 less than the national median household income of $53,657. That ranked the state 29th among the 50 states and 6th among the group of seven neighboring states. Nationally, Maryland ranks first with $$73,971 while Mississippi ranks last with $39,680. Regionally, Minnesota leads and Montana ranks last. In South Dakota's two main metro areas, women earned on average about $11,000 less than their male counterparts in 2013, although that is for all work and not only full-time employment. That figure places the Sioux Falls and Rapid City metropolitan areas in the middle of the pack for the gender wage gap in the Upper Great Plains region, according to an online analysis of all the nation's metro areas. The lowest paid men in Rapid City, at $13,000, work in “food preparation and serving occupations,” while the lowest paid women, at $11,000, also work in that category. The similarly situated metro areas in the region with smaller wage gaps are listed below. The similarly situated metro areas with larger wage gaps are listed below. Nationally, the legal occupations – listed as “management, business, science, education, legal, community service, arts and media” -- had the largest wage gap at $48,118 while the food preparation and serving occupation had the smallest gap, at $1,566. Two years ago, the Sioux City metropolitan area enjoyed the highest increases in real personal income in the nation, according to a new analysis released by the US Bureau of Economic Analysis. Sioux Falls was not far behind. Meanwhile the Rapid City metropolitan area suffered significant declines and was among the lowest in the nation. For the state as a whole, South Dakota enjoyed one of the highest increases in real personal income in 2013, experiencing a rise of 2.0 percent. The increase ranked fifth highest in the nation. The growth in real incomes was helped by the fact that South Dakota enjoyed the third lowest overall cost of living, as measured by the BEA’s analysis of regional price parities by state. The state’s year-over-year increase in the cost of living was the lowest in the nation at 0.1 percent. The BEA’s report adjusts personal income based on national and regional cost-of-living and inflation factors. The report concluded that total real personal income in Sioux City rose 4.8 percent in 2013. The boom in Sioux City reflected a dramatic rebound after real personal incomes declined between 2011 and 2012. 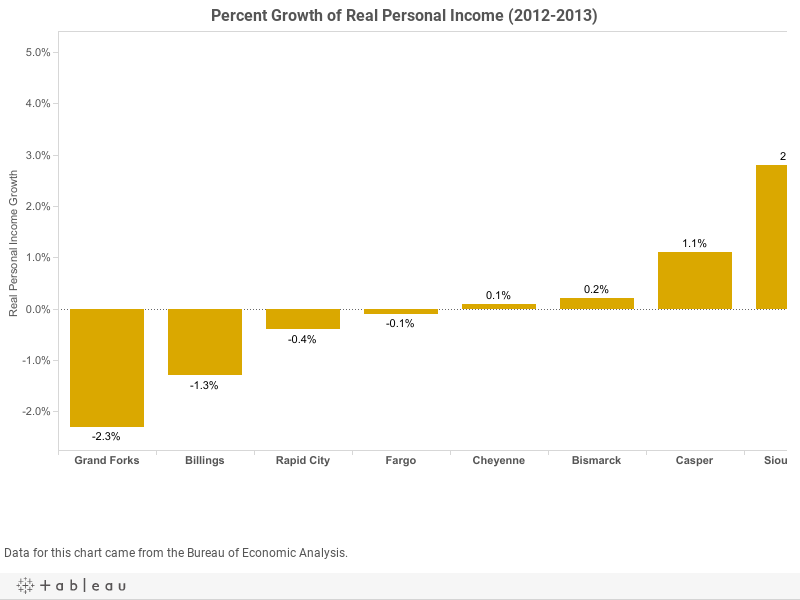 In 2013, real personal incomes rose 2.8 percent in Sioux Falls and declined in Rapid City by 0.4 percent. Changes on a per capita basis provide greater insights into the overall increase in prosperity. In Sioux City, the increase in real per capita personal income was also 4.8 percent, while in Sioux Falls it was only 0.3 percent. 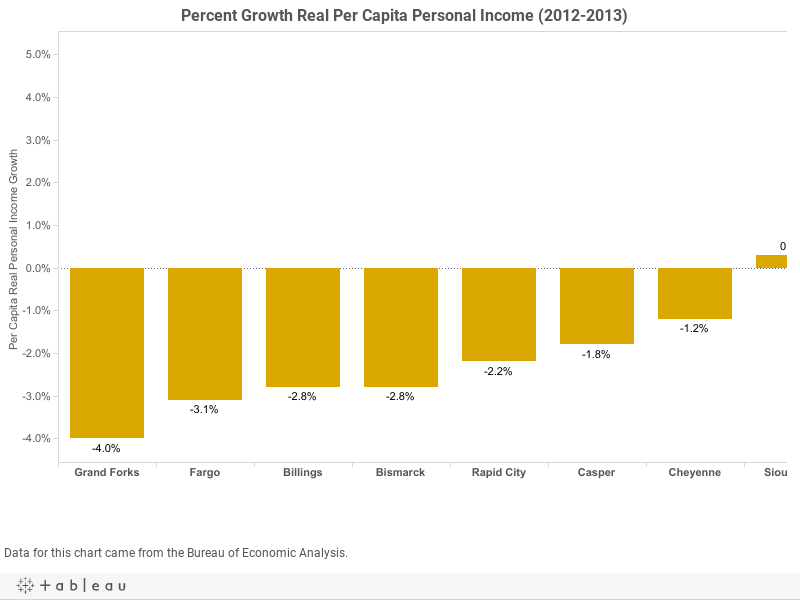 In the Rapid City metropolitan area, real per capita personal income declined 2.2 percent. For more information, see the press release from the US Bureau of Economic Analysis. To explore further data on incomes in South Dakota, see our interactive charts and graphs. Personal income declined by $336 million or 0.8 percent in South Dakota during the first quarter of 2015, according to the U.S. Bureau of Economic Analysis. Sharp drops in farm incomes throughout the Great Plains were a major factor. Across the United States, earnings increased 0.8 percent in the first quarter of 2015. Declines in farm income more than offset income gains in all other sectors in South Dakota, Nebraska, Kansas and Iowa. Among the fifty states, only Iowa turned in a lower personal income performance than South Dakota. Net earnings from wages and business income actually dropped 1.9 percent in the state in the first quarter. Cost-of-living increases for Social Security benefits helped offset some of this decline in the state’s personal income by increasing transfer receipts by 1.4 percent, while increases of 0.8 percent in earnings from dividends, interest and rents provided another boost to an otherwise flagging economy. In South Dakota, seasonally adjusted Farm earnings fell by $696 million from the fourth quarter of 2014, down 25.29 percent. The strongest growth sectors on a percentage basis were Utilities (up 3.54 percent) and Construction (up 2.89 percent). Health Care and Social Assistance saw the largest increase in actual earnings, up $65 million in the first quarter. For further details, see the release from the U.S. Bureau of Economic Analysis. South Dakota ranks 48th nationally for the wage needed to afford the average fair market rent for a two-bedroom apartment, according to a report released by the National Low Income Housing Coalition. The report calculates that a worker would need to earn $13.41 per hour to afford a two-bedroom apartment at $698. That wage is $4.91 more than the state's minimum wage of $8.50. South Dakota compares to No. 52 Puerto Rico on the low end at a needed wage of $10.53 and No. 1 Hawaii with a needed wage of $31.61. The report notes that the average renter in South Dakota earns $10.67 per hour, making a rent of $555 affordable. A minimum wage worker would need to work 49 hours per week to afford the average one-bedroom apartment at $540 per month and 63 hours to afford a two-bedroom unit. The report finds Douglas County the most expensive county for renters, with $16.04 per hour needed to afford a two-bedroom apartment at fair market value. The remaining top five counties are Pennington ($15.27), Buffalo ($14.83), Fall River ($14.42) and Custer ($14.23). In South Dakota, 32 percent, or 103,264, of households are rented. After four years of slow but steady growth in median income, South Dakotans who live outside a metropolitan or micropolitan area are closing the income gap with their city cousins, according to federal data recently updated through 2013. While South Dakotans who live in metro areas still take home more bacon to the tune of $11,000 per year, those in metropolitan areas have seen median incomes stagnate and dip in recent years while their country cousins have chugged upwards. The gap between South Dakotans of non-metro and metro status has gone from $17,000 in 2008 to $10,000 in 2012, the smallest such gap since at least 1999. It was a rural county -- Bon Homme County -- that saw the state's largest percentage increase in median income between 2012 and 2013. Bon Homme County was up 9.5 percent, from $41,827 to $45,803. As non-metro incomes continued their steady growth, metro incomes resumed growth between 2012 and 2013, widening the gap to $11,000. The Black Hills region has seen a similar stagnate trend, however the median income in the Black Hills has slipped in recent years, and now a gap exists between the region and the state as a whole. The median income in the Black Hills region has held at about $47,000 since at least 1999, keeping it virtually even with the overall state figure. But when the state's overall median income ticked up to nearly $50,000 in 2011, the Black Hills region remained at $47,000 and then dipped to $46,750 in 2013. Among the state's nine micropolitan areas, the Pierre micropolitan area (Hughes, Stanley, and Sully counties) ranked No. 1 at $58,121. The Vermillion micropolitan area (Clay County) is last at $38,173. Among South Dakota's 66 counties, Lincoln County in the Sioux Falls metro area maintained its No. 1 spot, with a median income of $78,567 in 2013. Buffalo County, on the Crow Creek Indian Reservation, stayed in last place with a median income of $21,572. Buffalo County also logged the largest percentage drop in median income, at 15.6 percent, down from $25,552. The city of Harrisburg, in Lincoln County, claims the No. 1 spot for South Dakota's most populous 27 cities, with a median income of $72,404 in 2013. The city of Tea, also in Lincoln County, is at No. 2 with $71,975. All of the top five cities are in southeast South Dakota, and four are bedroom communities to the largest city of Sioux Falls, which ranks No. 7 with $51,672. The state capital of Pierre is No. 6 at $55,063, while third-largest Aberdeen ranks No. 9 at $47,963 and second-largest Rapid City ranks No. 11 at $46,370.